Choosing your Apple Watch: Which size and material are right for you? Fashion and customization are cornerstones of the new Apple Watch, and as a result the company has put forth no fewer than a dozen different combinations of case material, color, and size. AppleInsider breaks down the choices to help you decide which one to buy. 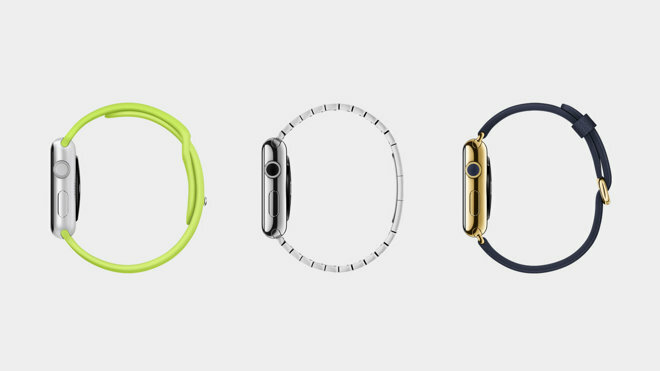 Each Apple Watch model comes in a choice of two case sizes: 38 millimeters and 42 millimeters. Those measurements mark the height of the case from lug to lug, but do not include the lugs, which are built into Apple's straps. The display is slightly larger and the case slightly wider on the 42-millimeter variant and Apple says that the larger version "typically experiences longer battery life," but the two are otherwise outwardly identical. In the Sport and Watch collections, the cost difference between the two is just $50, and there is no specific price difference for Edition models, which vary widely in cost. That leaves the choice down to personal preference, and there are a couple of resources to help you make your decision. Since you won't be able to try one on in an Apple Store until April 10 —the same day that preorders begin —the Apple Store app contains actual-size renderings of each case. If you don't already have it, the Apple Store app is available on the App Store. 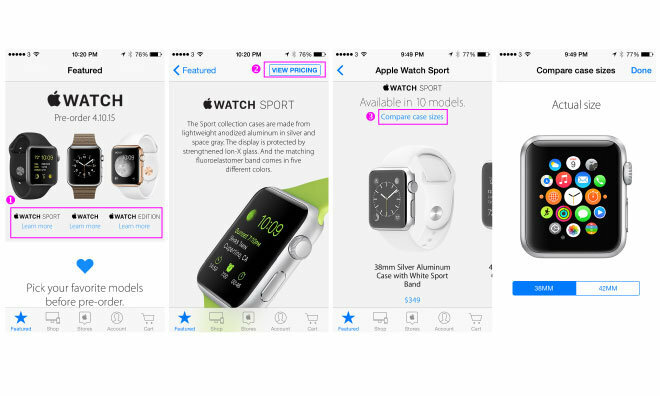 Previews are accessed by opening the app, selecting a Watch family, tapping "View Pricing" in the upper-right hand corner, and then tapping "Compare case sizes" in the center of the screen. For a more visceral wrist sizing, you could also download this printable comparison designed by photographer Ryan P. Mac. Printing it at 100 percent, or normal size, will yield two actual-size mockups that can be cut out and compared. Each of the three Watch families is distinguished by the material they're made of. The Sport versions are aluminum, the Watch collection is stainless steel, and the Edition models are 18-karat gold. Sport is offered in silver or space gray aluminum, with no price difference between the two. The stainless steel Watch comes in traditional silver or space black steel, though the latter is only available in a $1,049 38-millimeter or $1,099 42-millimeter configuration. Edition models are available in yellow or rose gold, again with no difference in cost when comparing similar bundled bands. Aesthetics (and cost) aside, your choice of case material has some very real implications: each one is heavier than the last. The 38-millimeter Sport weighs in at 25 grams, and the 48-millimeter variant is 30 grams. Those numbers increase to 40 grams and 50 grams, respectively, for the Watch collection and 55 grams and 69 grams for the gold Edition models. That means that the 42-millimeter Edition is more than twice as heavy as its Sport counterpart. Even the more modest stainless steel Watch is over 60 percent heavier, possibly making the choice easier for those who prefer lighter watches —and these weights vary even more when adding in straps, which we'll cover later today.